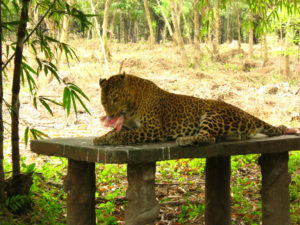 Tourists will also find cubs and grown up leopards which were rescued from illicit animal smugglers on the hills. They are providing rehab facility to all the animals suffering from various kinds of torture and danger. There are 18 leopards in this center. The environment of the place is serene and tourists will find it interesting to watch the animals enjoying themselves in their home. River Buri Torsha flows through the forest which can be spotted by tourists on jeep safari. South Khayerbari Tiger and Leopard Rescue Center can be reached by train, road or air service. Tourists will have to get down at Hasimara and travel to Madarihat which is 12 kilometers from the Hasimara station to arrive at South Khayerbari. You can reach the center by car through NH-31 which connects entire forests of Dooars to Kolkata metro city in West Bengal and also to Guwahati in Assam. Alternatively, if you are traveling by air, then Bagdogra is the nearest airport from where you can hire cars, taxis and even buses to arrive at Madarihat and finally reach South Khayerbari. 3 forest cottages are available for the tourists to stay near South Khayerbari Rescue Center. All of these cottages are set up on the bank of Buri Torsha River and food is served inside the cottage only. You must book the cottages from West Bengal Forest Development Offices before visit. An amazing tiger and leopard safari will take you through the forest where you will be able to spot the majestic animals busy in their lives. The highlight of this safari is that you can see these animals up close. Apart from the safari, you can also visit the forests nearby like Chilapata, Buxa Tiger Reserve, and Jaldapara. Boating on the River Buri Torsha is also available inside the rescue center. This entry was posted by indispottravel in Dooars in West Bengal, Forest Bungalow in West Bengal, Jungle Safari in West Bengal, West Bengal, Wildlife in West Bengal and tagged Boating on the River Buri Torsha, Buxa Tiger Reserve, Chilapata, cottage booking in South Khayerbari Tiger and Leopard Rescue Center, cottages South Khayerbari Tiger and Leopard Rescue Center, distance of South Khayerbari Tiger and Leopard Rescue Center from alipurduar, distance of South Khayerbari Tiger and Leopard Rescue Center from Hasimara, distance of South Khayerbari Tiger and Leopard Rescue Center from JNP, distance of South Khayerbari Tiger and Leopard Rescue Center from siliguri, dooars in west bengal, doors north bengal, dours tour, Forest, hotels in South Khayerbari Tiger and Leopard Rescue Center, how to go to South Khayerbari Tiger and Leopard Rescue Center, how to reach South Khayerbari Tiger and Leopard Rescue Center, Jaldapara, jungle, north Bengal, rooms in distance of South Khayerbari Tiger and Leopard Rescue Center, South Khayerbari, South Khayerbari Tiger and Leopard Rescue Center, South Khayerbari Tiger and Leopard Rescue Center location, staying options in South Khayerbari Tiger and Leopard Rescue Center, Tiger and Leopard Rescue Center, tiger and leopard safari, wildlife sanctuary. Do you have an email address for khairbari royal bengal tiger rehabilitation and research center please?